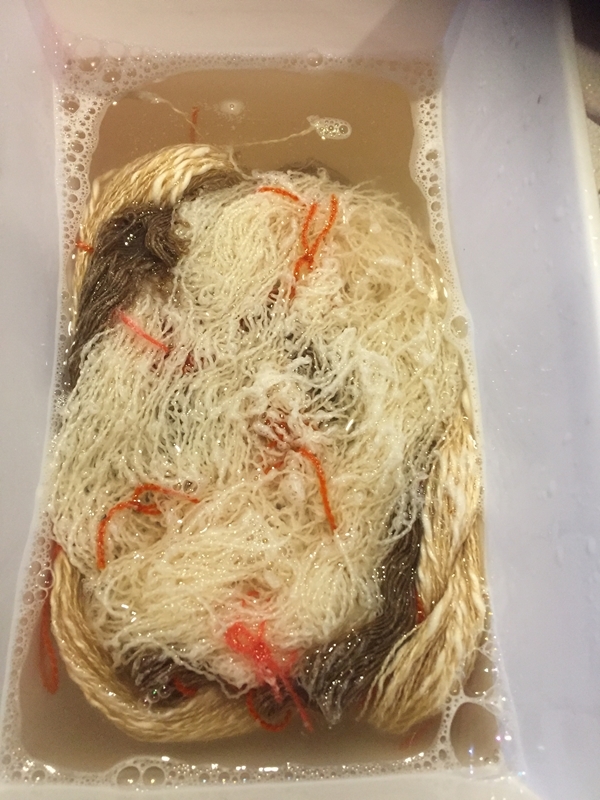 This week I decided to do some yarn dyeing. I bought some ends of cones someone brought in to the guild. They are perfect for me as I don’t need large amounts of any yarn. 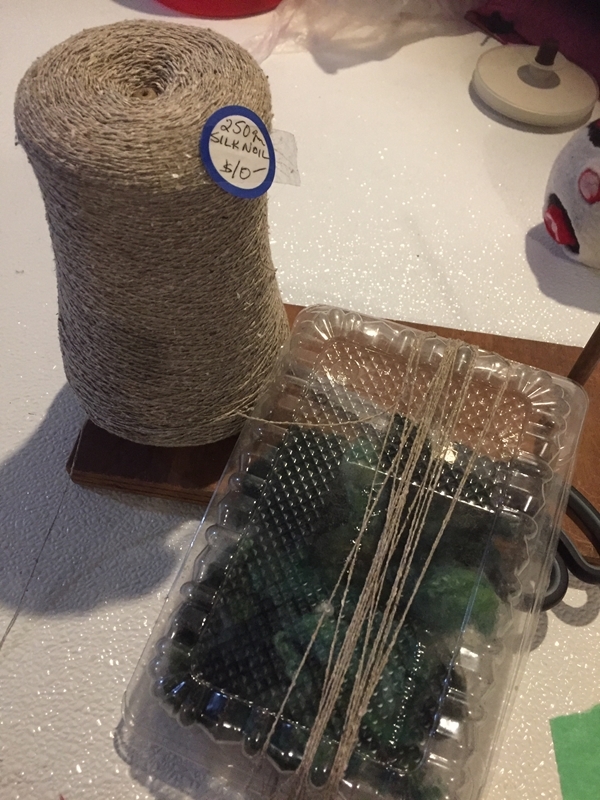 I couldn’t find my niddy noddy so I just wrapped the silk around a plastic box of curls. This is the largest cone I got. There was only one so I guess that’s why no on else wanted it. It is quite fine and it is a single yarn. I liked it because has little nubby bits. The other cones I got were almost empty. I did 3 kinds of silk or at least I hoping the other two were silk. More on that farther down. 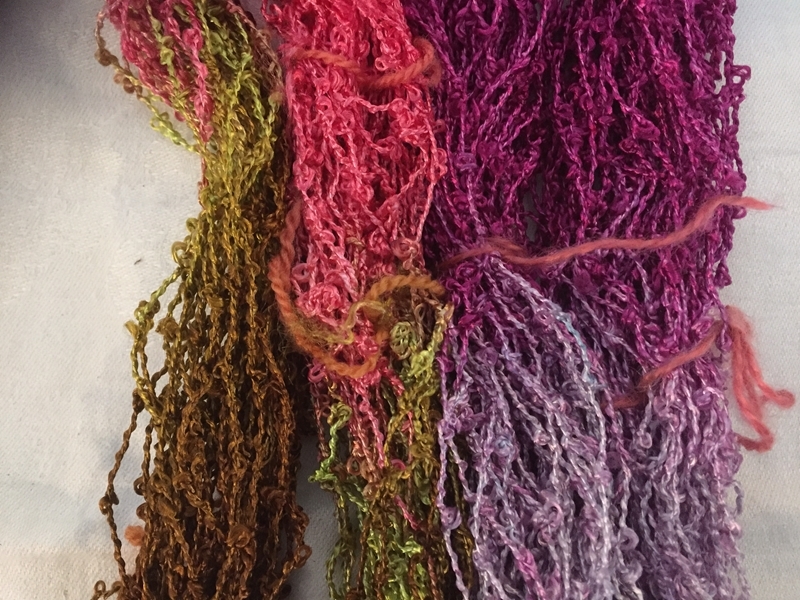 You can see the other tow yarns in this close up; there is one with slubs and one that is super shiny and has little loops. 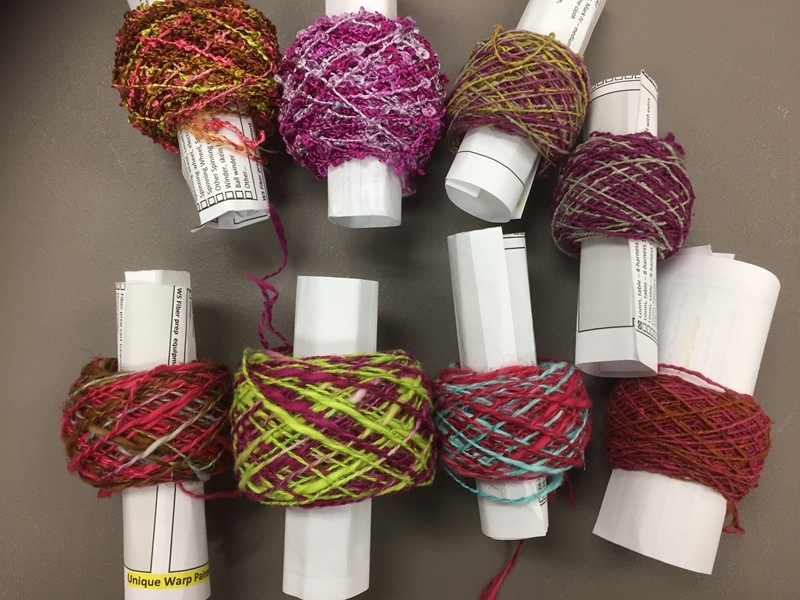 I planned to use MX or fiber reactive dye for these. 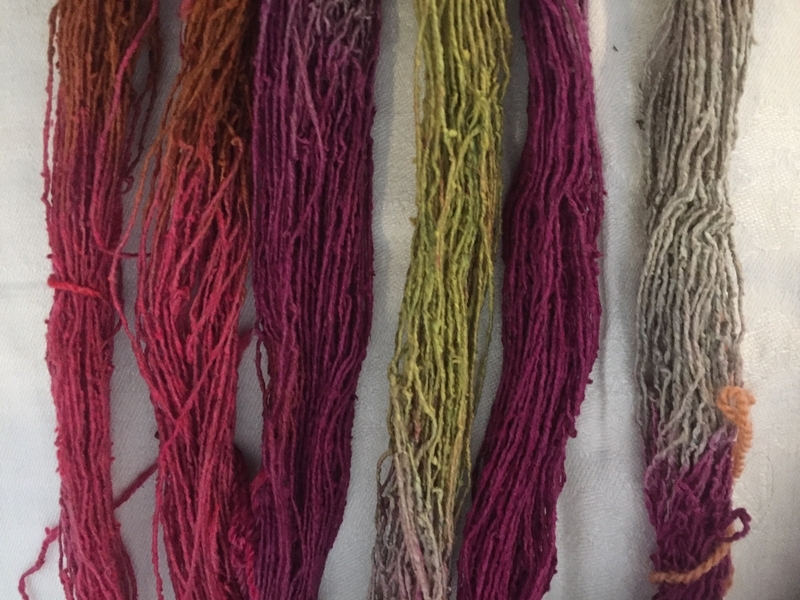 I wanted to do them with more than one colour so I soaked them in a soda ash bath. I was surprised at how dirty they were. 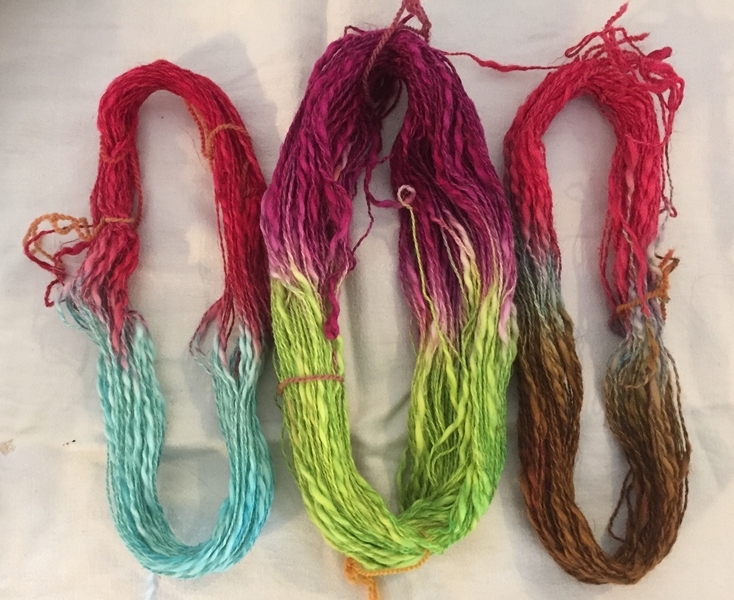 Next I made up small amounts of dye and dipped the yarn into them. 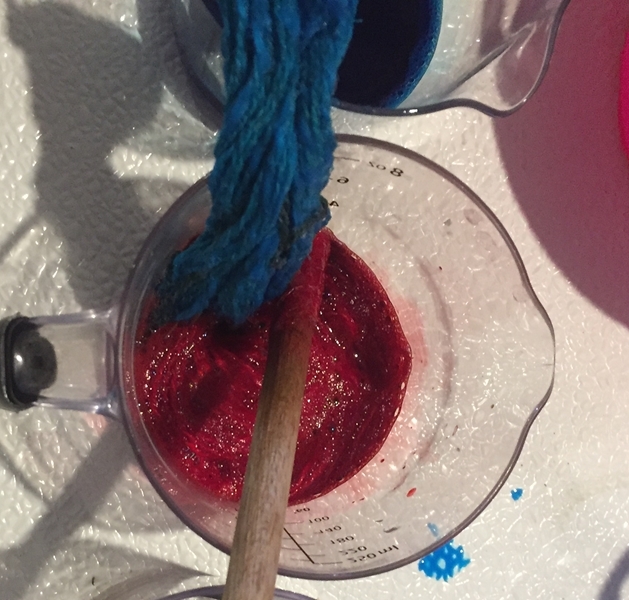 I made sure they were wall soaked in the dye then squeezing the excess out with a gloved hand. Then they are places on some plastic wrap them up. They need to sit a couple of hours before rinsing. Two of the ones with purple on them took a lot more rinsing, one of the silk noil and one of the shiny ones. Not sure why. This is the silk noil. The grey areas were turquoise. I am assuming it is grey because of the original colour of the yarn. You can also see it got some twist energy back and has little twists now. this is the one from the first picture. The other two were very white. This is the one with the slubs. I was not sure this was all silk. I think that one of the ply’s is not silk. 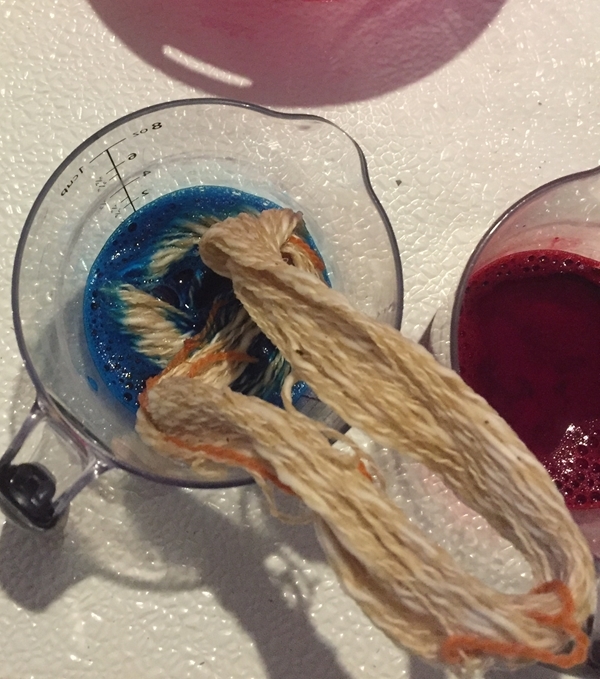 It must be a cellulose fiber but it did not take the dye quite the same. The fluffy slubs are definitely paler. This is the last one. I really like the lavender that happened because I forgot to wipe the purple off my gloves before squeezing the excess dye out the turquoise part. Last night with the help of guild friends I put them all into center pull balls. 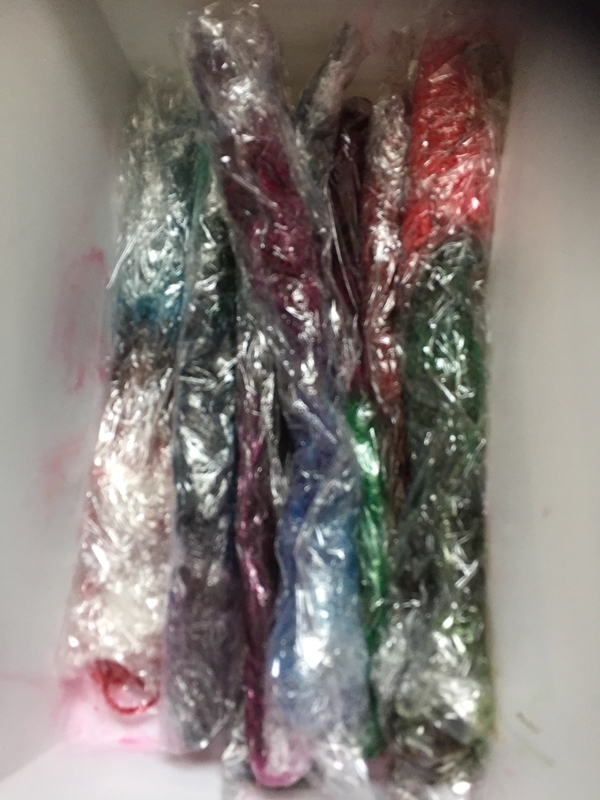 All in all a very satisfying dye session. I am sure they will look very nice on some felt. 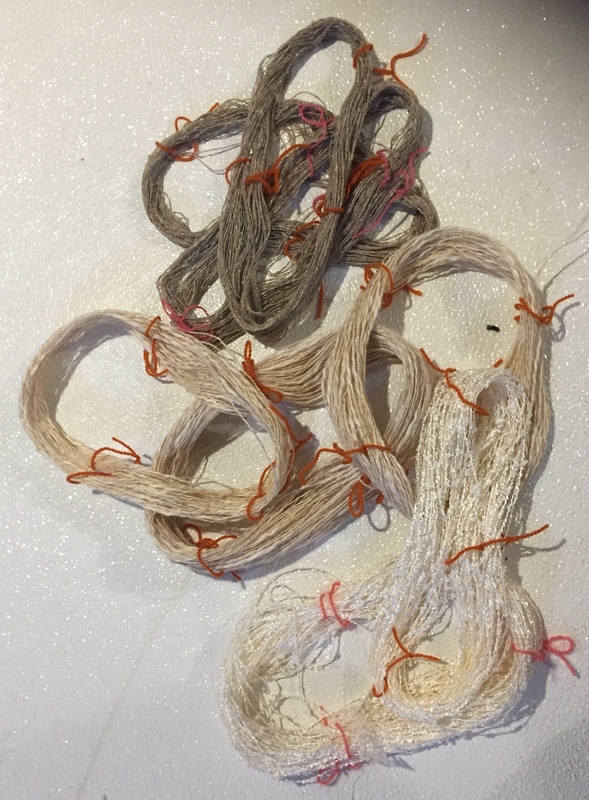 I may use some of the silk noil to ply with something else. I am not sure I will have to see. 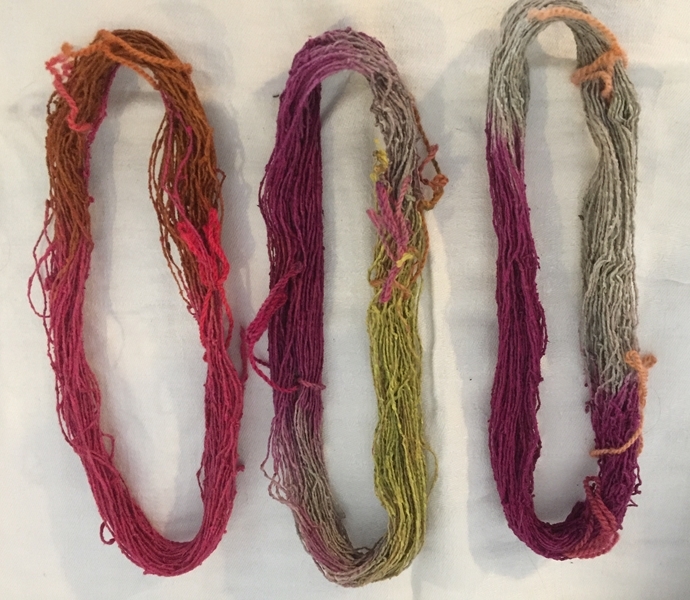 This entry was posted in Design, Dyeing, Silk, Uncategorized and tagged dying silk yarn, Fiber reactive dye, MX dying, silk noil. Bookmark the permalink. Lovely colours, Ann. I think they will be great inclusions / embellishments for felt. Look forward to seeing how you use them. Thanks Lindsay, not sure where they will end up. What beautiful colours you achieved Ann! Lovely process photos too – are you using your new camera? Thanks Lyn. No I am not used to having it yet so by the time I am taking pictures I would have to go get it. They are from my phone. I love nubby yarns. You got a great variety of colors. I look forward to seeing how you use them. Thanks Marilyn. i am looking forward to see what I do with them too. These look great Ann. 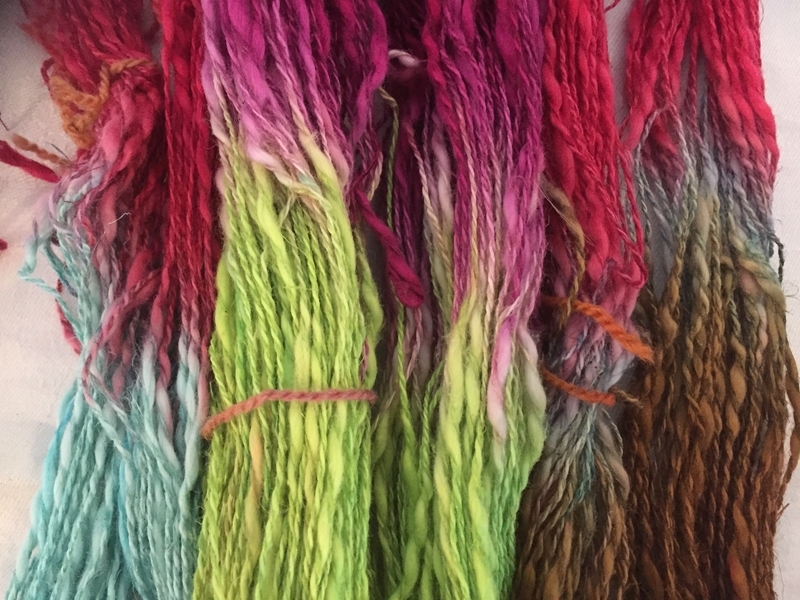 Turquoise/blue is one of the colors that take the longest to strike on any type of fiber. That’s probably why you lost a lot of color with that. I always love the results when they are rolled back up into a ball. You can really see the mix of colors better that way, can’t you? These would be great for couching down too besides just including them in the felt. Thanks Ruth. it was funny because they where all sitting about the same amount of time. I luckily really like the gray. I had thought of using grey. I like them better in the ball too. except maybe the silk on the bottom right. It looks so drab. Drab colors are great for natural things such as trees, plants, landscapes etc. 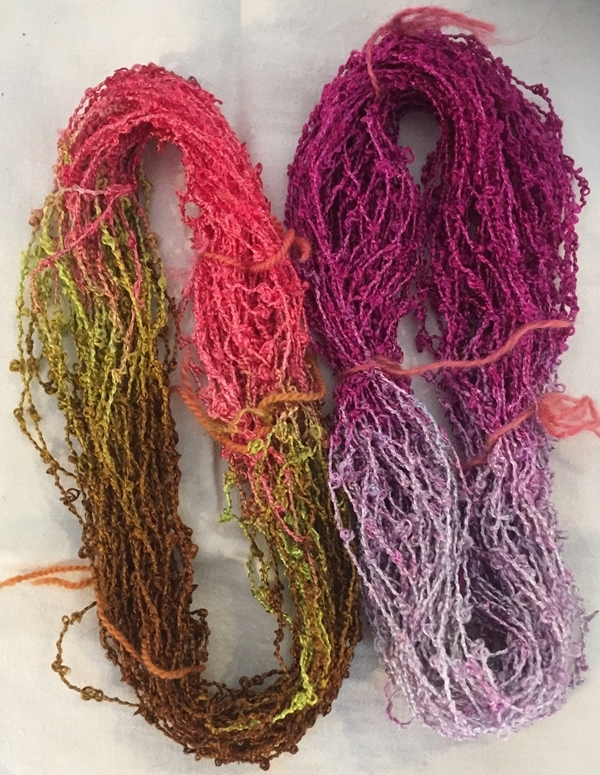 Great colours Ann including the paler variegations, and interesting to see the difference between the dyed hanks and the finished balls. Like you I love slubby yarns. Looking forward to seeing how and where you use them. Thanks Antje, I need to do some more thick and thin spinning too.